Hesychasm (Greek: ἡσυχασμός, contemporary Byzantine Greek pronunciation: [isixaˈzmos], from ἡσυχία Greek pronunciation: [isiˈçia], esychía, "stillness, rest, quiet, silence") is a mystical tradition of prayer in the Eastern Orthodox Church (Gk: ἡσυχάζω Greek pronunciation: [isiˈxazo]: "to keep stillness") by the Hesychast (Gr. Ἡσυχαστής Greek pronunciation: [isixaˈstis]). The Uncreated Light that the Hesychast experiences is identified with the Holy Spirit. Experiences of the Uncreated Light are allied to the 'acquisition of the Holy Spirit'. Notable accounts of encounters with the Holy Spirit in this fashion are found in St Symeon the New Theologian's account of the illumination of 'George' (considered a pseudonym of St Symeon himself); in the 'conversation with Motovilov' in the Life of St Seraphim of Sarov (1759–1833); and, more recently, in the reminiscences of Elder Porphyrios (Bairaktaris) of Kafsokalivia (Wounded by Love pp. 27 – 31). The Islamic counterpart is called Muraqaba which appears similar to Jewish word Merkabah. There are two concepts about the nature of union with God. 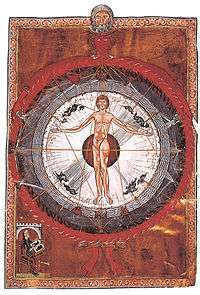 One is called unity of being by Ibn Arabi but orthodox scholars criticize it as pantheistic. Indian Sufi scholar Ahmad Sirhindi proposed unity of perception where a Sufi is so immersed in divine vision that he forgets everything including himself. ↑ "John S. Romanides, ''Some Underlying Positions of This Website'', 11, note". Romanity.org. Retrieved 2014-02-06. ↑ "John Cassian, ''Conferences'', 10, chapters 10-11". Newadvent.org. Retrieved 2014-02-06. ↑ "Laurence Freeman 1992" (PDF). Meditatio.ca. Retrieved 2014-02-06. ↑ "DOMINGO V DE PASCUA". ↑ Wakefield, Gordon S. (1983). The Westminster Dictionary of Christian Spirituality. Westminster John Knox Press. ISBN 978-0-664-22170-6. ↑ Ware, Kallistos (2000). The inner kingdom. St Vladimir's Seminary Press. p. 102. ISBN 978-0-88141-209-3. ↑ Cutsinger, James S. (2002). Paths to the heart: Sufism and the Christian East. World Wisdom, Inc. p. 261. ISBN 978-0-941532-43-3. 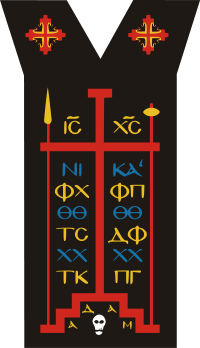 1 2 John Meyendorff (editor),''Gregory Palamas - The Triads'', p. xi. Books.google.com. Retrieved 2014-02-06. 1 2 "Adrian Fortescue, "Hesychasm" in ''Catholic Encyclopedia'', vol. VII (Robert Appleton Company, New York, 1910)". Oce.catholic.com. 2013-08-12. Retrieved 2014-02-06. ↑ Saint Gregory Palamas (1983). 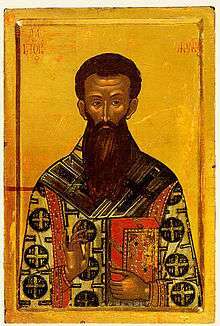 Gregory Palamas. Paulist Press. p. xi. ISBN 978-0-8091-2447-3. ↑ Andreas Andreopoulos,''Metamorphosis: The Transfiguration in Byzantine Theology and Iconography'' (St Vladimir's Seminary Press 2005, ISBN 0-88141-295-3), pp. 215-216. Books.google.com. Retrieved 2014-02-06. ↑ Michael J. Christensen, Jeffery A. Wittung (editors), ''Partakers of the Divine Nature'' (Associated University Presses 2007 ISBN 0-8386-4111-3), p. 243. Books.google.com. Retrieved 2014-02-06. ↑ Michael J. Christensen, Jeffery A. Wittung (editors), ''Partakers of the Divine Nature'' (Associated University Presses 2007 ISBN 0-8386-4111-3), p. 244. Books.google.com. Retrieved 2014-02-06. ↑ "Pope John Paul II and the East Pope John Paul II. "Eastern Theology Has Enriched the Whole Church" (11 August 1996). English translation". Rumkatkilise.org. Retrieved 2014-02-06. ↑ "Original text (in Italian)". Vatican.va. Retrieved 2014-02-06. Parry, Ken (1999). The Blackwell Dictionary of Eastern Christianity. Malden, MA. : Blackwell Publishing. ISBN 0-631-23203-6.